I was fortunate enough to be born in 1992 – a year in which LP/CD/Audiocasette stores were everywhere and people were still enthusiastically buying music. On top of it all, I come from a family of musicians, so you can imagine the kind of musical collections I grew up with. By 1992, the CD had already established itself as a major music format and its importance in people’s lives was unquestionable. I remember asking my parents for CDs every time there was an occasion – birthdays, name days, Christmas, I would always get tons of CDs or audiocassettes of my favorite ‘90s artists as gifts from my parents. I was (and still do it by the way) giving CDs to my friends too. I’ve never really thought about the true value of a vinyl mostly because I was too young and basically moving along with the trend. The technological advancements in sound quality and proliferation and affordability of HiFi stereos made it even easier for people to enjoy music and purchase CDs (and audio-cassettes till early 2000s actually). As I was getting into music more and more with each second, it was only natural for me to discover the magic of a vinyl record. I guess it all fell into place when I became a die-hard fan of old-school rock music. When this whole new world opened up in front of me, all of a sudden I had tons of exceptional ‘60s, ‘70s and ‘80s rock bands settling in my heart and they brought so much more than mind-blowing rock&roll in my life. These great artists brought with them the old ways of music which eventually became a staple for me. Of course, growing up with artists like Eric Clapton, The Beatles, Chicago, Toto, Tina Turner, Foreigner and similar, had a lot to do with my natural progression towards becoming the ultimate classic rock enthusiast. When you reach the next level of fandom, listening to Led Zeppelin or The Beatles on a CD might not be satisfying enough. I’m not sure I can fully explain it but as I was growing up and my level of music expertise and knowledge of rock music history expanded, my preference for musical formats changed too. I still buy CDs all the time but it’s the LP records that excite me and make my heart jump the moment I come across a LP store. Some of you may know this but I live in Seoul at the moment, though I come from Bulgaria. Just like in my other countries around the world, in Korea too record stores keep on disappearing as we speak. Korean pop is still a massive force and the market for idol merchandise, including CDs, is still going strong. For a moment, if we forget about Kpop and focus on the international music market, there aren’t actually that many places that offer a wide selection of past and current releases. Moreover, my adoration for second-hand LP record shopping had to be satisfied sooner or later. After my favorite little local record store closed (because of course it had to) I felt quite lost for a little while. I had this routine and the owners knew me not just because I was the only foreigner who would come every week but because I would spend a long time there, browsing and listening to music and trying to find comfort. Eventually, I was fortunate enough to be brought to this underground shopping area, located in Myeong-dong (명동), Seoul. I’ve been to Myeong-dong area plenty of times but never knew that there was this second-hand vinyl heaven right beneath my feet. First time I went it was quite late and I couldn’t really make the best of it. I promised myself to devote at least one day and go through each and every LP that was there! I kept my promise….multiple times Ha! I wanted to share this meaningful experience with you, guys and emphasize once again on how magical it can be to dive into this world of old-school music, put into a vinyl record so many years ago. I am well aware of the fact that most of my readers are probably from previous generations and grew up with LP records so they keep on buying and collecting them. However, it’s not just the older rock fans that know a thing or two about records. Believe it or not, there are many younger people, like myself, out there who are devoted LP collectors and appreciate this format. With this publication, I wanted to not only share what it is like to go record shopping in Seoul, Korea, but also to emphasize and remind everyone that records are the real deal and no other format can ever replace the value and the spirit, this vinyl carries within itself. I truly hope you enjoy the photos! …But this is where we are heading for! Myeong-dong underground shopping center – that’s where the real music is! After a couple of minutes this breathtaking view welcomes you to paradise! There are plenty of music stores in that underground area but this one is the biggest and offers the widest selection of records. On top of it all, it’s not just this one wall – the owner has little record displays everywhere. I love going there because they have the best ’80s hard rock LPs and in the greatest condition (I am convinced he is a huge classic rock fan)! Don’t even get me started on how awesome the prices are! Of course, there are plenty of other genres offered – you can spot classic music, jazz music, pop music, ’90s music and many other subsections! …In addition to vinyl records, they also offer CDs (second hand, of course). Here, it says that you can get 4 CDs for 10.000Won, which is around 10$. My favorite section – the place where all the great things happen is this one – this little shelf that contains mostly Korean (or Japanese) pressings of LPs from the good old days of hard rock (a.k.a the ’80s). The prices vary from 5.000Won (5$) to 15.000Won (15$), depending on the condition or popularity of the LP. I’ve been going there for quite some time now and what truly impresses me is that there are new (old) ones every time! Some even quite rare, actually! There is a little chair provided for the people (like me) who just have to go through every single record and make sure nothing is left unseen. Time flies so fast when you are looking for your next big discovery! Fortune’s self-titled debut album is one rare-gem! I have never came across it and knowing how rare it is, I just had to buy it! The prices of both were 7.000Won (7$ each). It’s crazy, right? Excellent condition, still with their lyric and promo sheets inside! This is what I’m talking about – I don’t know about you, guys but the thrill of browsing through records and all of a sudden finding one that you wanted so much can be such an emotional moment. Moreover, the most amazing thing is that these kinds of experiences can make you feel so much closer to the music. I didn’t have the chance to be born during the time these albums were released. I never attended their concert or passionately discussed such records with my friends. For someone like me, this is the most genuine way to feel that ’80s rock vibe. For a second there I feel like I was part of it all and it feels so good! Just like that, by holding an old-school second-hand record, I was brought back to the late ’80s and time didn’t matter anymore, it was all about my favorite music and me. Moving on to the big wall of records… I just had to browse through them all. Other interesting records I thought I’d never see in Korea! Another separate CD section for the enthusiastic collectors. There were a couple of more stores which I had to visit before I leave. Though this one was the biggest and definitely the best, sometimes you never know what will jump out of the old vinyl boxes. Interestingly, there were plenty of people who were browsing and looking around. Korean people haven’t fully given up on LPs and that’s great! I don’t have Guns N’ Roses’ “Use Your Illusion I” and it was such an amazing deal that I just had to buy it! There are plenty of LP stores all over the underground shopping center but some of them were closed as it was too early when I went there. Of course, there are stores that offer the suitable sound equipment for listening to those LPs you just bought. …and there’s me at the end of my record shopping journey all happy and full of smiles, holding my three new LPs. I hope by my words and photos you can tell how exciting and joyful this whole experience was for me. I do that quite often but this time I decided to photograph it all step by step with the hopes of triggering pleasant emotions to my readers and create a sweet memory. I am leaving Korea for good pretty soon but this habit of mine will keep on existing wherever I go. I hope that people out there don’t forget the many benefits of purchasing a record and don’t stop doing it. As I said, that’s one of the most beautiful ways of going back in time. 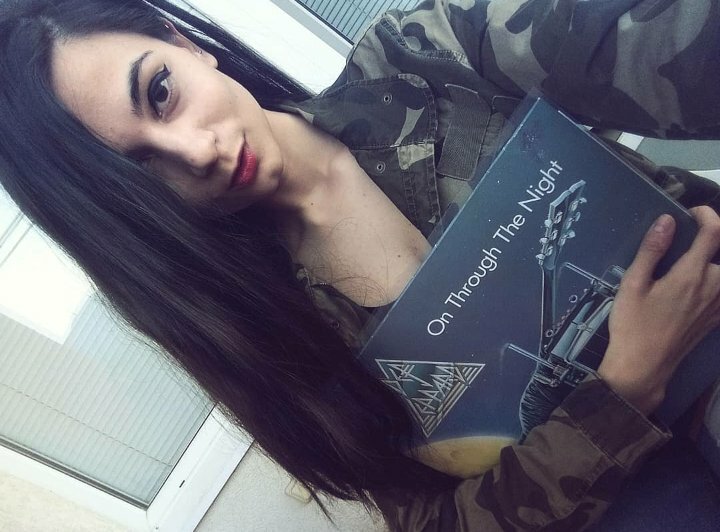 Imagine – this LP was made 30+ years ago and somehow it found its way to your arms. To me that’s just so extraordinary. When I went back home I had the chance to take a closer look at my new LPs. Ain’t they amazing? P.S. All the photos are taken by me. Please make sure that you don’t just save and use them without my permission! Rock on! haha that Willy Wonka reference is right on point! You would’ve loved it! This is my favorite kind of day to have! Music shopping. I’ve only been to Seoul once, and for a very short while. Wish I’d known about, and had time to visit, this place. Only for one day but it was amazing. I was in Incheon for a few days too. I had such a good time in S. Korea. Would love to go back. Especially now I know where the good record shop is! Greetings! Great Post! I will visit Korea and i will visit all this vinyl stores! I search special community or group in fb, for vinyl funs in Seoul (exchange and buying). Can i bring some vinyl records for exchange? Hi, Im in Seoul right now. And is there any chance to know which part of myeong-dong this store is located? I’d really love to visit this store as soon as possible. All is explained in the publication. I think when you type it on google maps it will appear!